Mix all the spices together and put to one side. Brush the sliced aubergine with olive oil, place on a baking tray and sprinkle the spice mix over them; season with salt and pepper. Place the tray in an oven for 25-30 minutes, turning over halfway, until the aubergines are tinged golden brown around the edges. Mix the yoghurt with the tahini adding a squeeze of lemon, then dilute with a splash of water to create a good drizzling consistency. 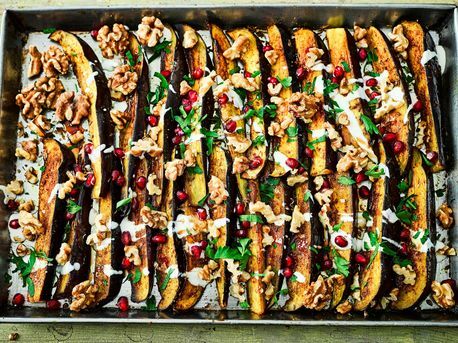 Drizzle the aubergines with the tahini yogurt and pomegranate molasses. Sprinkle pomegranate seeds, chopped California walnuts and flat leaf parsley over it to serve.